You will be amazed by the magnitude of germ armies lurking for a hole in your immune system. 5 basic hygiene rules are suggested to help you stay intact. Tablet devices help you be updated and available but they do undemine your body health due to continual flexion according to recent study from Harvard. Learn here about improper posturs recorded and best practices to avoid strain on neck and shoulders. 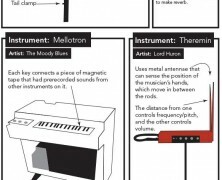 Odd instruments used in popular music.